If you’ve been in the retro gaming scene for a while, you may have come across Mario Adventure. A massive hack of Super Mario Bros 3 with a ton of new technical additions and a full set of new levels, the game ended up becoming one of the most well known, highly regarded Mario ROM hacks in existence. And so when it’s creator DahrkDaiz said he’d make a sequel, we knew we needed to get an interview about it. So here it is! Here is our exclusive interview with Mario Adventure creator DahrkDaiz! 1. Let’s start with a quick question about your personal life, shall we? So what’s your background here? Who are you outside of the ROM hacking community? In my down time I’m a programmer for a house manufacturing company (the largest one in the US!) My family consists of my 5 year old daughter and my wife of 6.. 7… er 5 years? I don’t remember! My real name is April and outside of rom hacking I like to go hiking, running and play DanceDanceRevolution. At around the mature age of 4, I stumbled upon this weirdly coloured thing at my cousin’s house where a brown man was jumping over a jump rope made out of fire. They asked me if I wanted to jump the rope and handed me the controller. Of course, that game was Super Mario Bros. for the NES. I was so enthralled by this idea of a “videogame” that my dad went to a local flea market and came across an Atari 2600 with 50 games. He bought the set and brought that home. I immediately started ignore chores, back talk my parents and re-enact the scenes I had experienced in Galaga, Donkey Kong and Tanks! 3. What about ROM hacking? How did you get into modding Super Mario Bros 3? So this one took several years. At some point in my life I ran across an article in a magazine called Electronic Gaming Monthly (or just EGM). I read this religiously, buying every issue and memorizing the prayers and sacrifices I needed to make in order to get the best games. I remember a tiny article talking about “Challenge Games”, a little online group that had somehow edited existing NES games and released them in new, more Challenging versions. It would be years before I got a computer, but once I did, I remember seeing that article and started to hunt for “Challenge Super Mario Bros. 3”. I eventually found it around the second semester of college. I immediately started to ignore homework, back talk my professors and re-enact the scenes I… er, never mind. 4. Mario Adventure stuff now. What inspired you to create that game? And why Mario Adventure as the name? Ever since I first played Super Mario Bros. 3 at the age of 8, I wanted to make my own video game. It’s actually why I became a programmer in the first place! I even had grid paper at one point that I designed my own Super Mario World levels on. Though, playing them on paper was a bit more difficult and less fun. 5. Mario Adventure is also known for a fancy weather system that changes between levels. How did that come about? Lol, I wouldn’t call it fancy. More like half-arsed. I actually originally thought the idea of a seasonal Mario game would be amazing, where every level was slightly different based on a season. That idea came from Click Clock Wood from Banjo Kazooie. This level had different areas accessible depending on the season. Well, I couldn’t exactly program a season in SMB3, but random weather seemed like the next best thing. 6. How about the whole Boom Boom at the end of each level thing? Why did you remove the traditional end roulette? I simply liked the idea of having different Boom Boom fights. I wanted to see how many times I could change up the same boss fight. 7. The world themes are a tad more original here as well. How did those come about? I love the traditional themes (fire, grass, water, etc) in games. Everything from Whomp ‘Em to Mega Man. So, of course I would come up with some themes that were similar, but center it around some sort of enemy habitat. 8. A few quality questions now. What levels are you most proud of in the game and why? I honestly can’t remember most of the levels in the game. However, I loved the idea of Desert Dares though. I also liked the complexity some of the last levels in world 8. 9. How about your least favourites? Are there any levels you think could have been designed better? Most definitely the ice level with the “Warkitu” (Lakitu that through Bob-ombs that exploded quickly). That level was just pure evil. 10. Either way, Mario Adventure has a reputation as being one of the best Mario 3 hacks ever made. How does that make you feel? Did you expect that so many people would love the game? Shocked, to be honest. I’m surprised by how many people love the crazy challenge and haphazard ideas I came up with. Once I released it, I basically closed the door and moved on to other things. It was pointed out to me about a year later by a fellow rom hacker that my hack was getting noticed, a LOT. 11. So let’s move onto your later works now. What happened to Mario Adventure 2? Hard drive wipe. Long story short, my brother wiped my hard drive with fresh OS install. I used file recovery programs to try to find it again, but all I could get was a 2 week old version. This version was missing a lot of key features, such as green coins, a new map system and a few new enemies. It was such a devastating loss that I could manage myself to continue working on it. 12. Regardless, it seems the Mario Adventure ‘brand’ has been retired recently, with Mario Adventure 3 renamed to Super Mario: Mushroom Mayhem. Why? Mostly because I don’t want people to connect Mario Adventure with this. Sure, it has a lot of power behind the name, Mushroom Mayhem is a distant cousin of Mario Adventure. People will no doubt compare the two upon release, but I hope people see Mushroom Mayhem as a fantastic game, not just a rom hack. 13. Onto some game content questions now. Super Mario: Mushroom Mayhem has a ton of custom or customised enemies in it, with new Hammer Bros varieties, Lakitus and Chomps among them. How do you decide what new enemies to make for the game? A lot of the ideas come from ideas I had for Mario Adventure that I lacked the skill to implement. Some came from the idea that SMB3 hadn’t really implemented the enemies to their fullest potential (such as the Chain Chomp). I also wanted to tap into the often forgotten enemies from Mario’s past (such as Freezies). 14. What about the day and night system? That’s… new for a Mario platformer. Where did that idea come from? This was a direct rip off from Castlevania II, the first Castlevania I played. I loved that idea so much and I knew there were slight behaviour differences I could include myself depending on time of day. Most people just assume that enemies are tougher at night, but not always. For example, during the day, a Goomba will move towards you once it falls from a platform. The idea is that their eyes aren’t so good, so in the dark they continue to march in the direction they were going, but in the day they can make out Mario enough to turn in the right direction. 15. An EXP system seems to be included here, and it changes Mario’s abilities. What made you decide to include this in game? This comes from Castlevania: Symphony of the Night. The badge system comes from Paper Mario. I originally was going to make the game a gigantic level that you just traversed in one go, but the requirements in design for this type of game is immense and beyond my time. 16. Either way, it seems like there’s more of an ‘RPG’ feel to this title. Was that intentional? A little bit. One of the things I wanted to avoid was making the game too hard, so I figured some of the RPG elements could make the game get progressively easier. All levels are designed without the need for any of the extra abilities. This way players can find the game get a little easier even if the design gets progressively more difficult. 17. So recently, it seems custom boss fights made their way into Super Mario Bros 3 hacks, with Super Mario Bros 3Mix having all custom battles rather than the default Koopaling ones. Are similar custom boss battles going to be a thing in Super Mario: Mushroom Mayhem? Absolutely! Every world will have a custom boss battle. The first boss, Colossal Cheep, is already coded! 18. And what do you expect the world themes might be like here? I know the videos show grass, desert, snow and water levels. Are those all themes that’ll get worlds dedicated them? The themes actually are a mix of several. 19. One thing which has been heavily customised since the original Mario Adventure is the graphics, with almost all of the levels in your hacks having fantastic looking original tilesets. Do you draw those all yourself? 21. Moving away from questions about the game content for now though, how did you decide where to promote the game? Because I’ve noticed most of the updates here seem to be on social media sites like Facebook and YouTube rather than forums or ROM hacking sites. Is this to get more people interested in ROM hacks? There’s a lot of rom hacking forums. I originally tried to keep up with six different threads at one point. I tried Tumblr and I think another blog site. Facebook had everything I needed and it was easier to keep up to date considering I’m always on Facebook as it is. I had to look that up! I honestly don’t want to make any kind of money from this. Not that there’s anything wrong with it, I have a full time job as it is, so I’m not really hurting for cash. I’ve had others contact me about getting exclusive access to making physical copies first, which, I thought was super cool, but I really want every to get the entire game at the same time. 23. There have also been a few unfortunate cases of fan projects getting shut down by Nintendo recently, like AM2R and Pokemon Uranium. Are you worried that something similar could happen to Super Mario: Mushroom Mayhem? A little, but honestly, if they were to come after me, I may just go quiet and have it “leak” later on. 24. On a more positive note however, have you ever considered hacking any games other than Super Mario Bros 3? You hacked Ms Pac Man before SMB 3, so have you considered modding any other games afterwards? Like Super Mario Bros 1/World/New Super Mario Bros/whatever? I’ve actually done a few prototype hacks of Super Mario Bros 1 (look up Mario Seasons and Super Mario R), Mega Man 3 (Mega Man 3 Challenge) and Kid Icarus. Most of these never turned out to be full fledged releasable projects, but Super Mario R was finished. As for any other games? To be honest, I have a full time software development job and a kid, so free time comes at a premium. 25. Finally, what advice would you give people wanting to get started in ROM hacking, or game making in general? First – dive right in! Do what you can with the existing tools out there at first. Once you want to expand, rather than just learn ASM or programming in general, try to think of simple things you want to do but break it down into much simpler problems. Take adding a brand new enemy to a game. That enemy requires drawing, integrated in the existing enemy engine, hit detection with the tiles, the player, and it needs to move. This seems like a lot of work, until you focus solely on getting a new enemy added to the enemy engine (value wise) and getting it on screen. This can be for programming one from scratch to rom hacking – you have to break the challenges down into smaller problems that you can build your way up. So yeah, I think that wraps up everything up for now. I mean, we’ve gotta leave some secrets for the actual game here folks! People need to have an incentive to actually play Super Mario: Mushroom Mayhem instead of merely reading about it! But hey, what do you think of the interview? Did you find DahrkDaiz’s answers about his ROM hacks interesting? Did any of them make you want to play his new ROM hack when it’s released? Post your thoughts on the matter here in the comments or on social media today! And while you’re at it, follow DahrkDaiz on Facebook and YouTube today! 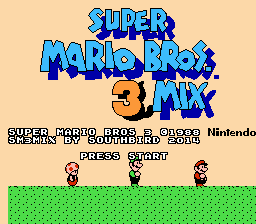 Let’s Interview; Super Mario Bros 3Mix Creator Captain Southbird! Let’s Interview; VinnyVideo of MFGG!